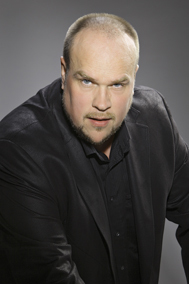 Juha Uusitalo was engaged by the Finnish National Opera as a soloist in 2000 and now tours major international opera houses as one of the greatest emerging bass-baritone singers of today. In recent years, he has appeared at distinguished venues with a number of prominent conductors such as Jukka-Pekka Saraste, Sakari Oramo, Leif Segerstam, James Levine, Sir Colin Davis, Zubin Mehta, Michael Tilson Thomas and Riccardo Chailly. In 2003, Juha Uusitalo made his Savonlinna Opera Festival début in the title role in The Flying Dutchman, followed by the same role at La Scala and the Vienna State Opera in 2004 and the Bavarian State Opera in 2006. At the Savonlinna Opera Festival he also sang the title role in Sallinen's The Horseman in 2005. In addition, he has performed in San Francisco and Boston, at the Tirol music festival, the London Proms and the Maggio Musicale in Florence and in Birmingham. In autumn 2008, he will make his début at the Metropolitan in New York as Johanaan in Salome by Richard Strauss, with Karita Mattila singing the title role. Juha Uusitalo's opera repertoire includes the great Wagner roles and also Leporello in Don Giovanni, Pizarro in Fidelio, Escamillo in Carmen, Mefisto in Faust and the title roles in Falstaff and Gianni Schicchi. Juha Uusitalo originally studied the flute and the piano, completing his flute diploma at the Sibelius Academy in 1995, and went on to play flute in a number of orchestras, most recently the orchestra of the Finnish National Opera. He began studying voice privately and then with Professor Pekka Salomaa at the Sibelius Academy opera studio, with Raimo Laukka and at masterclasses given by Ubaldo Gardini, Alberto Zedda and James King. Juha Uusitalo was awarded a grant from both the Finnish Wagner Society and the Matti Salminen Foundation in 1999, and won the Karita Mattila Prize in 2002.